Strategy Evolves, Does your Business? How did your business strategy come about? Was it planned out in advance in the boardroom, or was it done by some type of trial and error? Did you start out knowing exactly what you were going to become? We started with a plan, but it has evolved into one that has taken time and been filled with trial and error. We have had some fun at my office recently, creating a video that will help to generate a feel and personality that represents our company. Mainly, it shows that we can let our hair down (or put some on) and just have some fun. We did this by putting together a rap video in the imitation of a rap song out there called “Thrift Shop.” The reasoning for this video is two-fold: Making it helped to create fun in our company, and it shows you how you can have fun by using contesting in your company’s marketing strategy. A few weeks back, I shared what we are dong to move forward on the path of concentration around a certain focus with mobile. We have built a mobile app platform that is customizable and appropriate for our focus of working with marketing companies. This has been an evolution for us, and one that recently has had a lot of the details come together. As I shared before, mobile is growing and the smart phone is being adopted with exponential growth. It has provided opportunity for businesses to connect with their customers that has not been possible before. When we are looking at our business, it seems completely obvious we should just keep it simple. While this may seem obvious, it is much more difficult to accomplish in a complex world filled with complex processes, complex rules, complex people, and complex competitive forces. If we could be more disciplined and keep it simple in our businesses, would we have more success? Well, that is what Ken Segall says in his new book that explains how Apple’s success was based on not just simplicity, but the Insanely Simple. This past week, I set off to one of my favorite places on the planet for some recharging. I spent a week on a sailboat in the British Virgin Islands with friends and had a wonderful time! One of the islands, Jost Van Dyke, is known as a top ten destination for New Year’s Eve celebrations. What an extra special experience to sail to different islands and experience different beaches and breathtaking views! In business, we often strive to make all of our customers happy by being good at every feature or service we offer them. The problem is that being good at a lot of things makes it difficult to be great at any one thing. Why do we do this? We think we can excel in any one area when the reality is we are just good or average in all areas. Have you ever thought about trying to be bad at something you do so that you can grow your business and increase your market share? Steve Jobs And The Power Focus! I am writing this week’s blog on Friday, October 5, which has great significance for me. My partner of 20 years back in my investment days was born on this day, along with my lifelong best friend Ronald Poles. It is also one year from the day that Steve Jobs passed away. Verne Harnish reminded me of this in his blog, and he shared this video put out by Apple. It is a nice tribute and a great reminder of what he and Apple have done for our everyday lives. 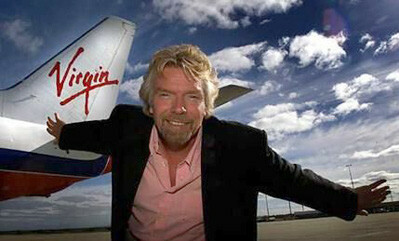 One of my by business idols is Sir Richard Branson, whom I have had the pleasure of meeting. My close friend Joe Hollingsworth has spent a week with him on his private island in the Virgin Islands and heard many interesting stories. What makes him really stand out to me is that he has started over 400 businesses and has had great success with many of them. He also has dyslexia, which resonates with me because so do I. Some may see this as a handicap, but I see it as one of the reasons he has achieved much success. Riding the Wave or Being Knocked Over? Have you thought about how fast things change and how really different things have become with how you work and live? Think about the companies that you use every day that didn’t even exist ten years ago. Think about how you use your smartphone today and access Facebook. How different, both good and bad, was your life back then? Consider all this from a business perspective. What new companies have appeared or disappeared because of a new innovative idea? Things move so rapidly! A company can go from zero to hero in a flash, but one can also go from kingpin to trash bin in the blink of an eye. Let’s continue our discussion from last week’s blog. How does Abundance solve the future problems that seem to loom before us like population growth, water needs, hunger, and power? Abundance Thinking holds the understanding that we have the capability to solve our pains with the technologies we have already created. Those technologies are at such a level that the continued connectivity of each of them creates exponential opportunities for solving all the issues of the day and the problems out ahead of us.